Mount Kinabalu re-opens to the public! Home/News/Mount Kinabalu re-opens to the public! Now that Sabah’s iconic national landmark, Mount Kinabalu, re-opens to the public, climbers are flocking to explore the World Heritage Site! There’s a newfound fascination amongst visitors with everything about this very special area of the Crocker Range mountains. 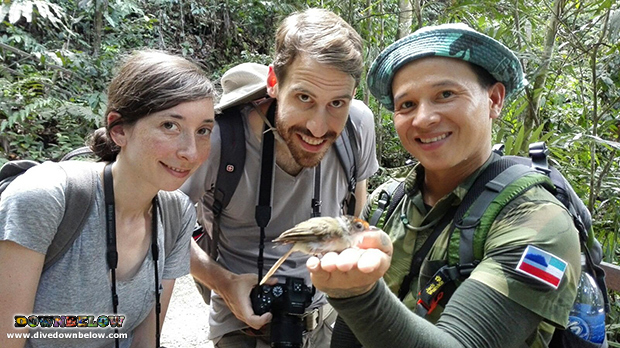 Our Sabah Travel Centre guests are no different, as they spent a day at Kinabalu National Park to spot wildlife and learn more about Borneo flora and fauna endemic to the park! The two opted for our promotional offer: 1-Day Kinabalu National Park and Poring Hot Springs program, which is a private tour and includes a private guide too. Meghan and Eric definitely made the most of this by spending as much or as little time as they wished at each of the attractions. They will be back soon to climb to Laban Rata to witness the environmental changes as they climb to the 3272m altitude of the plateau where they will stay overnight. Contact us for more details on the best preparation for the Mount Kinabalu climb! By Joanne Swann|2015-09-09T11:33:28+08:00September 4th, 2015|News|Comments Off on Mount Kinabalu re-opens to the public!